Just wondering how the designing for a logo etc are going, as I'd like to help and use my wonderful Powerpoint skills to make a poster. The sooner we get the posters and things up and running the sooner those who don't know about the competition can start saving up money for the flight over. If/ when the posters get up and running I'll be the first in line to do a Perth poster run sticking up posters in relevant places. id be up for doing that in adelaide too ! how is the wole organising of the comp going havnt had any news in ages ! Unfortunately the people who agreed to update the champs webpage and get onto the logo design have all but disappeared. If anyone feels they can help out in that department, please let me know (champs@yoyos.com.au). This weekend I plan on getting the competition categories up, as well as making the ozyya page a little more informative. just re-read this post! ill get crackin on the design. I'd hate to rush you guys organising it. And im sure you have alot of other stuff on your plate, but i was wondering if anything has happend yet like dates or anything atall? anyways ill giv the logo a whirl! I still haven't had any design luck. I'm just going to sit down and get it all done this weekend. I'll base it on the forum layout to make it easy. Once that's done it's back on with the big champs drive. Work has been keeping me stupid busy lately. I'd appreciate any offers to help moderate the forum too. im here to help, i got a design done if i can just find it, if u dont like it no biggy, i did it with a pen in class one day. crap i cant find it. ill search better later and post it. Metabolis wrote: I'd appreciate any offers to help moderate the forum too. I know i havent been a member here long but i do come here and read the posts often, just never seen the need for me to post. Anyway to the point, if you are looking for a moderator i am more then happy to help in that area, i run my own forum for a game at www.mglegends.com and it did have 150 members and over 5000 posts but the host/server crashed and we lost all so we moved, we have only just reopened it recently and having to rebuild it and change hosts lost alot of members but we have over 1500 posts now and over 50 members. so yeah if your after help im willing to help. ive got a design done. 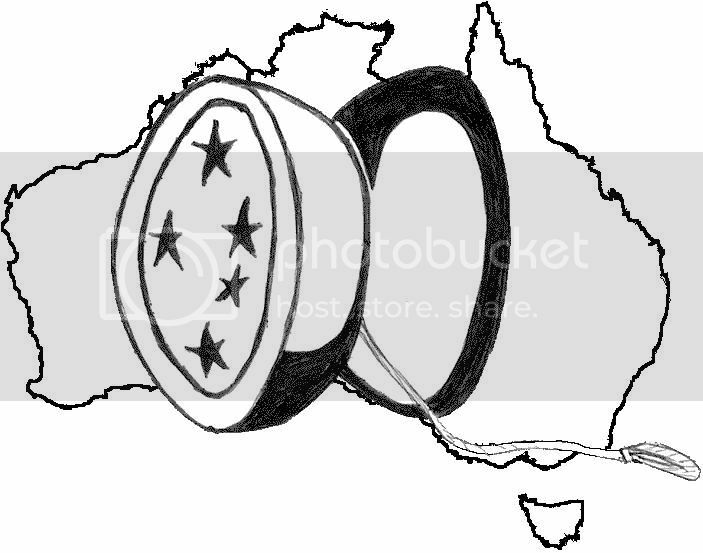 I drew the yoyo by hand and then pasted it in photo shop on a aussie map. I'll post the plain one and color one, just so if you have ne creative ideas u can toy with it. p.s. when it logo size it looks good. Yeah man i like it. i already told you ha ha. I think a logo like that would be better suited for use as the OZYYA logo. If you make the string coming out of the yoyo form the outline of the country (not as exact a coastline as currently), coming right back round to the bottom where the finger loop makes tasmania, I think that'd look cool. yea man, sounds rad indeedy. ermmmm, wat about the nats logo, im stumped? i like the sound of that ! Ok every one i think its time to get off our arses! Im not sure about you guys but i really want this thing to go ahead! I am only 14 years old but i will do anything in my power to make this happen! YOU SHOULD TOO! im not here to yell and put you down but really...............we need to do something. If any one has ideas or latest new please post! Lets make this happen and have some fun ey? im in agreeance with young edward here ! wats goin on mick we havnt heard anything in months !! The date and venue has been set, as can be read on the champs webpage.